Do I really have to tell you? OK, let’s assume you all know who Stephen King is. But did you know that as a child, he once lived in Stratford? And that Stratford and Bangor, Me., were the models for King’s fictional city of Derry, Me., which figures in several of his novels, such as “It”? King, who is the king indeed of contemporary horror fiction, is having quite a year: He is publishing two books – “Joyland” is just out and “Doctor Sleep,” a long-awaited sequel to his classic “The Shining,” in the fall. His novel “Under the Dome” is now a CBS-TV series, and in October, “Ghost Brothers of Darkland County,” a musical for which King wrote the book and John Mellencamp wrote the music, will go on tour. It’s already out in a CD box set, mini-documentary and e-book format. You can learn more about King in my interview piece about him that ran Sunday, July 14, in The Courant and is online now. And you may be one of the lucky ones who snagged a ticket to his appearance, with WPNR radio personality and Courant columnist Colin McEnroe on Thursday, July 18, at the Bushnell. Tickets are $25 to $75. Information: www.bushnell.org. King, as we all know, is quite capable of conjuring up supernatural stories that can scare readers to the point of being afraid to turn the page for fear of what is coming next, but this book is has a touching and poignant air about it and a mystery to solve. This is kinder, gentler King at his storytelling best. So you do not need to be a connoisseur of chills to find plenty to enjoy in “Joyland.” I’m betting it will be seen on beach blankets everywhere this summer. “Undeniable…charm [and] aching nostalgia…[JOYLAND] reads like a heartfelt memoir and might be King’s gentlest book, a canny channeling of the inner peace one can find within outer tumult,” says Booklist. Oh joy! 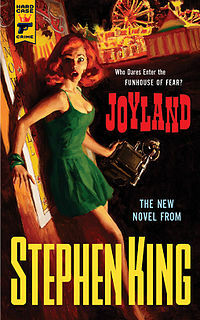 There are copies of “Joyland’ at the Albany, Blue Hills, Campfield, Dwight, Goodwin and Mark Twain branches of the Hartford Public Libraries now.